George W. Bush Raising Money For Republicans In Texas – But Not Ted Cruz? Former President George W. Bush is getting involved in the 2018 midterm elections after sitting out of politics for nearly a decade. He is helping to raise money for Republican candidates in Texas, but apparently not Ted Cruz which seems a little strange. Karen noted earlier that George W. Bush is lending a hand to Texas Republicans this year — which is amazing, for more than one reason. Who would have thought in 2008 that Dubya would ever again be an asset to the GOP on the campaign trail, especially in the age of Trump? And who would have thought that his party might actually need him to show up in his home state of all places, normally one of the safest red strongholds in America? 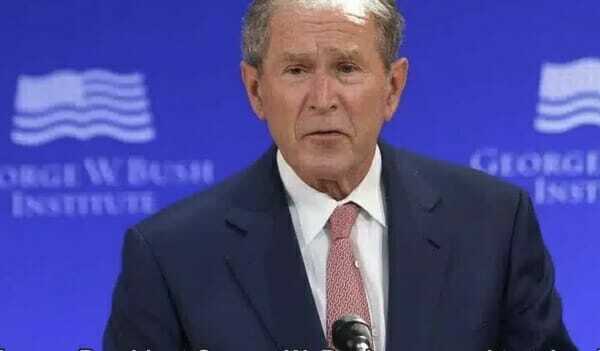 “While he prefers to consider himself retired from politics, President Bush recognizes how important it is to keep the Senate and decided to help a few key candidates,” Bush spokesman Freddy Ford told Politico. Noticeably absent from the list is Texas Sen. Ted Cruz, a Republican who is facing a surprisingly robust challenge from Rep. Beto O’Rourke, D-El Paso. Cruz once worked for the former commander in chief, both on Bush’s presidential campaign and then in his administration. The senator also met his wife, Heidi, while working for Bush’s campaign, leading him to say that he “will always be grateful” to the former president. But Bush hasn’t reciprocated many warm feelings for Cruz, who made his name by rebelling against the GOP establishment that Bush represents. It would be truly awful if this was about petty politics rather than what’s best for Texas and the country. The post George W. Bush Raising Money For Republicans In Texas – But Not Ted Cruz? appeared first on The Gateway Pundit. Source Article: George W. Bush Raising Money For Republicans In Texas – But Not Ted Cruz?